One of the five Britons released from Guantanamo Bay claims US guards at the camp in Cuba tortured and abused him. Jamal Udeen has told the Daily Mirror he went to Pakistan to study Muslim culture but was taken prisoner after straying into Afghanistan by mistake. The US, which denies claims of bad treatment at the camp, held him as a terrorist suspect for two years. Mr Udeen, 37, from Manchester, said he was beaten by men in riot gear after refusing to have a mystery injection. He said the guards had tried to get prisoners to confess to things they had not done. They were shackled and attached to metal rings on the floor during interrogation, Mr Udeen claimed in the newspaper. But he said: "The beatings were not as nearly as bad as the psychological torture - bruises heal after a week but the other stuff stays with you. "The whole point of Guantanamo was to get to you psychologically. " A spokesman for US Southern Command in Miami, told BBC News Online: "We do treat the detainees in a fair humane way, according to the Geneva Convention." 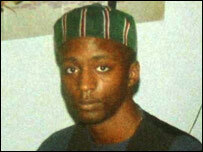 The US transferred Mr Udeen to the UK on Tuesday, saying he was a low risk. But Mr Udeen, a father-of-three, said inmates were kept in wire cages with concrete floors and no protection from the elements. He claims water to the cells was often cut off before prayers so Muslim prisoners could not wash themselves as their religion instructs them to. He told the Mirror their "recreation" time involved being untied and allowed to walk up and down a strip of gravel. "They actually said: 'You have no rights here'. After a while, we stopped asking for human rights - we wanted animal rights." Mr Udeen, who is from the Moss Side area of Manchester, said he was chained up and interrogated by the CIA and FBI on 40 occasions and that later MI5 officers also questioned him. Mr Udeen told the newspaper: "They would say: 'Are you a terrorist?' I'd say 'no, get me out of here'." The web designer, who converted to Islam when he was 23, said his nightmare began four days into his trip to a region of Pakistan on the border of Afghanistan. When the US began bombing Taleban strongholds he decided to leave and Mr Udeen said he paid a local truck driver to take him to Turkey - not realising the route would take him through Afghanistan. He said he was initially arrested by the Taleban as a suspected spy but, when the Americans arrived, US soldiers took him to a "concentration camp" before being moved to Cuba. Mr Udeen said he had agreed to tell his story to the Mirror to highlight the plight of those still being held at the camp. Meanwhile motoring and theft charges against another of the freed Britons, Ruhal Ahmed, from Tipton, West Midlands, have been dropped. The Crown Prosecution Service said the prosecution was "not in the public interest". "He is the first detainee to talk publicly about his time there"